I am in a never ending battle to keep my hectic life less cluttered. This fact spans all aspects of my world…from my office space, to my desk at home, to our garage, and everything in between. Kurt Kay & John Kurcheski of K Concepts have designed an interesting device for mounting some of your sports equipment (aka balls) to your wall, hoop, fence, goalpost, trunk of your car, etc. The Ball Claw is engineered to securely hold your basketballs, volleyballs, soccer balls, and footballs out from underfoot. The Ball Claw comes in three sizes: large for regulation sized basketballs (29.5″ and 28.5″), medium for #4, #5 soccer balls, volleyballs, and youth basketballs, and small for youth, high school, college and professional footballs. The Ball Claw is well constructed of a high-quality injection-molded ABS plastic that feels very sturdy when flexed. It can be used indoors and outside. 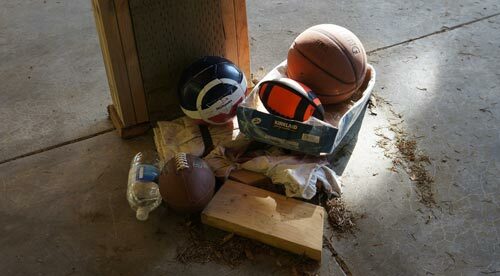 Sadly, this is one of several ways the Gadgeteer Kid and I store our sports balls. Definitely not he best way to keep/take care of your sports gear and equipment. Installation was a breeze. The Ball Claw comes with basic installation bits and pieces (aka screws and molly bolts). Using the Bosch impact wrench I reviewed a few years ago, it took the Gadgeteer Kid and me less than five minutes to install all three of the ball mounts to a pillar in our garage. The Ball Claws definitely work as advertised. They are well thought out, designed to last and at $12, relatively inexpensive. 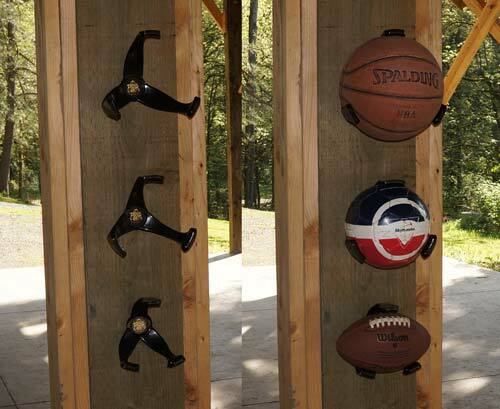 Truly a great way to keep your sport balls organized and out of the way. I do like the Ball Claw and have ordered another to hold a second basketball…..probably should get a second football one too ;). @Mark. Homedepot sells reels to store your garden hose. 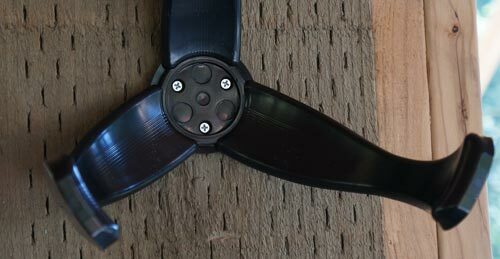 They can be wall mounted. Dave, Thank you so much for taking the time for such a great review!! I hope that you enjoy your Ball Claws this Spring and Summer! Johnny BallClaw! Should make another that holds five or six baseballs with a clamp for a bat and a hook for a glove.